SLAMMIN brings down the house with lightning-fast improvisation, electrifying harmonies, blazing percussive dance, and raucous humor. Deeply rooted in the grooves of Jazz, Funk, R&B and World Music, SLAMMIN pushes a cappella music outside the box, and over the ledge. Vocals by Bryan Dyer, Zo� Ellis, Kenny Washington and Destani Wolf. Body Music by Keith Terry. Plus a special appearance by Vicki Randall (#8, Freedom Jazz Dance). SLAMMIN's concerts are rowdy, funky, humorous, vibrant and fresh; the material -- old school, contemporary, and of the moment. Much of SLAMMIN's debut CD is improvised and live, capturing that energy. The album features these phenomenally talented vocalists playing off the other members of the band and reacting to the smallest nuances from the audience. The rhythm section lays down the ride, with Body Music throwing in a kinetic component unseen in a cappella music. As with every Crosspulse recording, the inter-culturalism and soul imbedded in the Oakland music scene is rampant. Mixing jazz, reggae and techno with a funky hint of Sly and the Family Stone, this body music group abandons not only convention but instruments altogether. 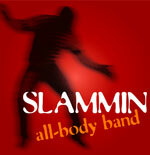 Slammin relies exclusively on the musical potential of the human body to cook up a fresh take on old favorites such as Miles Davis, Stevie Wonder and Toots and the Maytals. The Bay Area sensation, known for its signature off-the-wall improv sessions, offers up an organic blend of a cappella, beatboxing and body music (imagine a funk-soul version of Bjork's "Medulla").